The Big Fix-Up is gathering momentum. Every post-war residential district seems to be subjected to a bout of renovating, restructuring and upgrading. Few people visit redevelopment districts just for fun, so it’s all happening out of sight of the public at large. But luckily, the earliest results of renewal can now be viewed in comfort in the book De Grote Verbouwing and in the exhibition The Big Fix-Up at the Netherlands Architecture Institute. Luckily there’s good news too. There are post-war districts where talking, thinking and designing culminate in inspirational projects that look like they’ll live up to expectations and benefit their surroundings. The book repeatedly points out the high number of conservationist projects that take existing spatial qualities and/or (some) existing buildings as positive starting points rather than start from scratch. 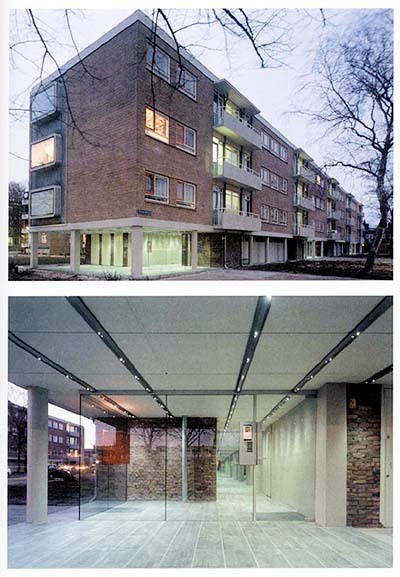 What’s also striking is that renovation schemes often produce the most exciting and differentiated programmes, sometimes by preserving existing architectural quality and sometimes by adding a shiny new skin. Paradoxically, it’s the condemned, monotonous post-war development that, in all its respectability, offers spacious and flexible structures and plots in comfortable densities that are no longer possible in new-build projects today because of economy measures. In that sense the potential strength of post-war residential neighbourhoods is remarkably similar to that of the Eastern Harbour Area in Amsterdam and the banks of the River Maas in Rotterdam. History provides space for something out of the ordinary. Renewal without destruction is therefore the best way of competing with new VINEX development. It’s a great pity and a puzzle why so few people appreciate the intrinsic qualities of post-war housing, apart from many residents, some designers, and a couple of odd architectural historians. Let’s hope that The Big Fix-Up opens more eyes! There’s been plenty of interest in individual projects, and some rather abstract studies have appeared, but The Big Fix-Up is the first broad survey of what’s really happening in post-war residential neighbourhoods. Both the book and exhibition provide extensive analysis and documentation of thirteen big restructuring projects as well as a more concise round-up of over 150 smaller projects, largely supplied by the proud developers and architects themselves. In addition, the book includes a couple of short and convincing essays, and the exhibition features TV documentaries and historical design drawings. The broad scope of The Big Fix-Up is at the expense of depth, but the texts and images do throw up points for discussion – even though social aspects are largely ignored. The points of interest are depressingly familiar: planning often proceeds in a highly fragmented manner, and the upshot is that a neighbourhood built as a single entity disintegrates programmatically and aesthetically into a patchwork of piecemeal solutions that sometimes conflict with one another. Many of these part-solutions pay no heed to the urban and architectural context and are nothing more than islands that contribute little to their surroundings. The situation is made worse because developers, particularly where public planning is weak, often opt for the easiest and most profitable short-term solution and lose sight of the bigger picture in the process. A surprisingly large amount of low-rise development is replaced by low-rise development for example, while adjacent and often far less attractive high-rise stays standing. Moreover, well-intentioned ideas about density and social control often result in new development that covers public space and green areas in many neighbourhoods – always handy when it comes to clearing out buildings earmarked for demolition. 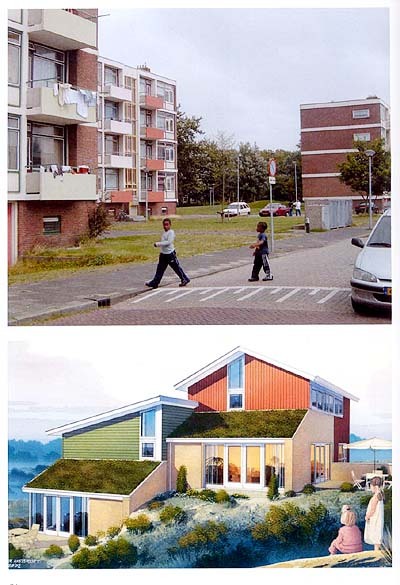 But filling in open space only impoverishes these neighbourhoods and makes them less, not more, attractive. The architectural quality of much, though by no means all, new development is debatable, but there’s no accounting for tastes. Exhibition: The Big Fix-Up is on show until May 31 at the NAi, Museumpark 25, Rotterdam.